Graduating from college is an exciting time to be sure. You have been in school for most of your life, so finally getting out can be an incredible feeling. You will probably feel like the world is at your fingertips, and you will have nearly endless options in front of you. Of course, this time of life can also bring you a rude awakening, as it is at this point that many people realize just how expensive life can be. Now that you are out on your own in the ‘real world’, the bills just might start to pile up in a hurry. 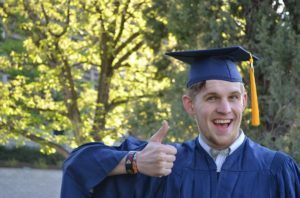 With that in mind, here are five helpful ways for you to save money as a new college graduate. Good luck out there! One of the first things you should do when getting out of college is seek to settle your living situation. You will need a place to live, and you will want to keep costs down as low as possible at first. Pick out a modest place and do your best to find a roommate (or two) to help you share the costs. Dividing up living expenses like rent and cable is a great way to lessen the burden that you will feel right out of college. It might be tempting to pick up a sweet new ride once you get your first adult job, but that is usually a mistake. If possible, stick with the car you have for now – or at least, buy a used car to get yourself started. There will always be plenty of nice cars for you to purchase later once you are settled in to adult life and have a good idea of your budget for a new car. Do you know how to cook for yourself? If not, now is the time to start. Cooking most of your meals at home instead of ordering out is a great way to save money – and it will likely be healthier as well. You don’t have to train yourself to be a gourmet chef, either. Even just some basic cooking skills and a few tools will go a long way to help you save money as a new college graduate. If you don’t yet have a spouse or kids to consider, think about finding a place to live that is as near to your job as possible. You will save on transportation costs this way, and since you have a short commute, you will have extra time available in your day as a side benefit. Speaking of not having a family just yet, this point in your life would be a good time to consider working an extra job, or taking on a side hustle, in order to make additional income that can be saved for later. Taking on a part time job on the weekends or in the evenings might not be a ton of fun, but it can do great things for your finances later on down the line. Can you think of any other ways that new college graduates can save money? Did you do any of these things to save money as a new college graduate? Aside from getting a roommate, I think getting an apartment close to your workplace is equally important. This strategy helps me save much more money as it is just a walking distance.